Three days in the peaceful Quaker haven of Woodbrooke: what a lovely prospect, I thought, as I set out for Birmingham at the end of February. Little did I know how disturbing it would be to hear the testimony of Muslims who are confronting Islamophobia. This is a country which might consider itself relatively tolerant of different religious beliefs, but it is clear that there is an atmosphere of tension and mistrust of the Muslim community in Birmingham and beyond. The weekend started with one of the famously delicious meals provided by Woodbrooke’s culinary team. That evening we were introduced to the couple who were the facilitators of the sessions. Attalah is a convert to Islam, and his wife Rehanah was brought up in the faith in Birmingham. It was fun to see them interacting in a way which denied the stereotype of Muslim women being subservient. They answered any questions we had openly and honestly, with humour, and seemed to welcome our sometimes naive questions. What came shining through from them (and all the presenters) was their concern that their faith is misrepresented in the media, and the sense that the extremists (ISIS) are an aberration of the ethics of Islam. It would be like judging Christians by the Klu Klux Klan. The importance of efforts to create connections between people of different faiths also came through loud and clear. What also became evident was the overlap of Islam with the key Quaker beliefs of honesty, peace, equality, and simplicity. An Imam explained some of the central beliefs of Islam, including the study of the Q’ran which includes many references to Old Testament prophets as well as Jesus and Mary. The central belief is that Mohammed is the last and most important prophet. The significance of the haj (a pilgrimage to Mecca) was explained, as was the difference between Sunni and Shia sects. Rehanah led a session specifically addressing the misconceptions about the place of women in Islam. She personified a liberated, well-educated and worldly Muslim woman. She gave us specific advice on how a Muslim prefers to be greeted, as well as explaining her own choice to wear a Hijab (modesty). She also highlighted the importance of women in the religion. Another speaker, Dr Laura McDonald, raised our awareness of the way in which the media can skew coverage of Muslim affairs, and in particular the damaging association of mainstream Islam and ISIS. On Saturday evening, we broke into smaller groups and had more intense discussions. One speaker, Moazzam Baig was imprisoned at Guantanamo. He was never charged with a crime, and was imprisoned in solitary confinement for three years. He explained his ability to forgive his captors, and his belief that bitterness was not an option for a true Muslim. We also heard from Riaz Mohammed, one of the school governors involved in the Trojan Horse controversy, and Hifsa Iqbal, who explained some of the efforts of the Muslim community to prevent radicalization. On Sunday, we were privileged to hear from Jahan Mahmoud, a former advisor to the government, and now commentator. If you type his name into YouTube, you can see some of his illuminating commentaries on radicalization. The analogy of treating Muslims as ‘other’ was very disturbing, as it seemed similar to the way the Jews were seen as less than human in 1930s Germany. Woodbrooke runs this course each year, and I would recommend it to anyone wishing to learn more about this widespread and influential religion. It made me want to learn more about the teachings of the Q’ran, and reminded me about the importance of understanding the multicultural society which is the reality of England. Sitting in the calm and beauty of Woodbrooke it is hard to imagine the intolerance which is often encountered by Muslims. 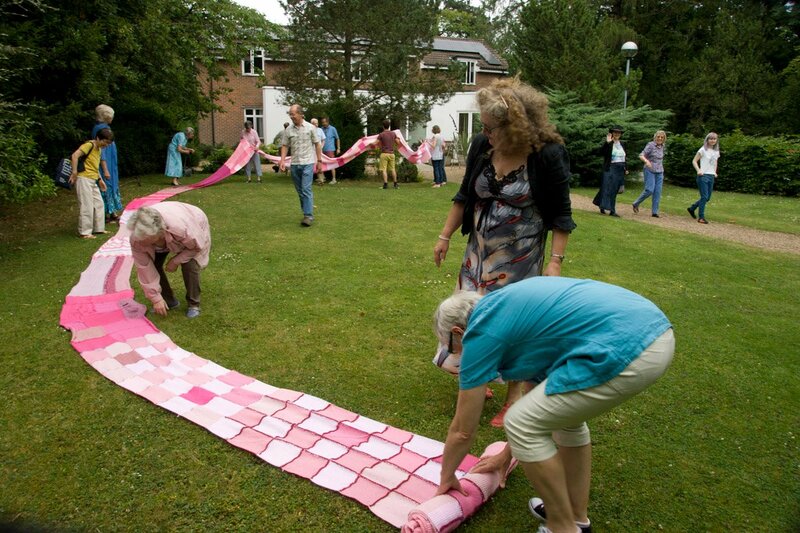 If you are interested in what you can do to reduce Islamophobia in our area and beyond, you may like to get involved with the work of the Watford Interfaith Association, which encourages interaction between different religions on a personal basis. Last year, many of our members enjoyed the Interfaith pilgrimage, which visited six different places of worship in Watford, and also the McMillan coffee morning at the North Watford mosque. 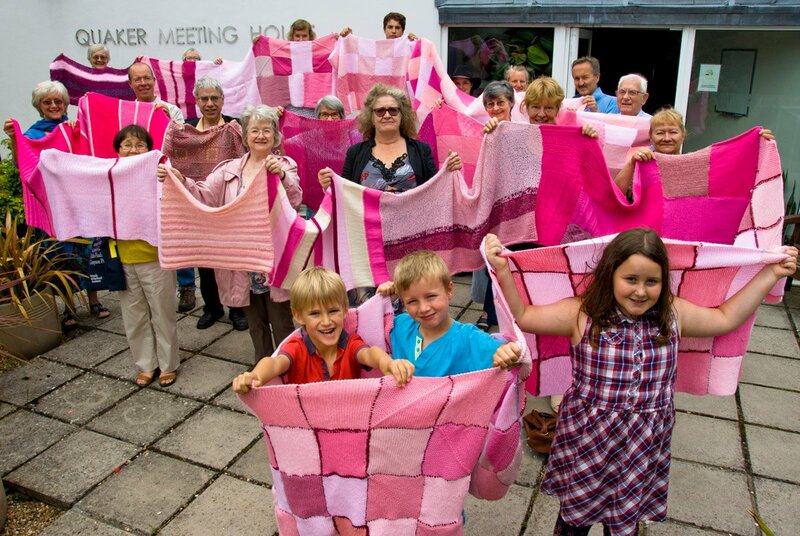 A number of member of Watford meeting got knitting to help create part of the 7 mile pink scarf to stretch between Atomic Weapons Establishment sites at Aldermaston and Burghfield, Berkshire, where nuclear weapons are made. More details about the Watford wide effort can be seen on the here, on the Watford Observer website.